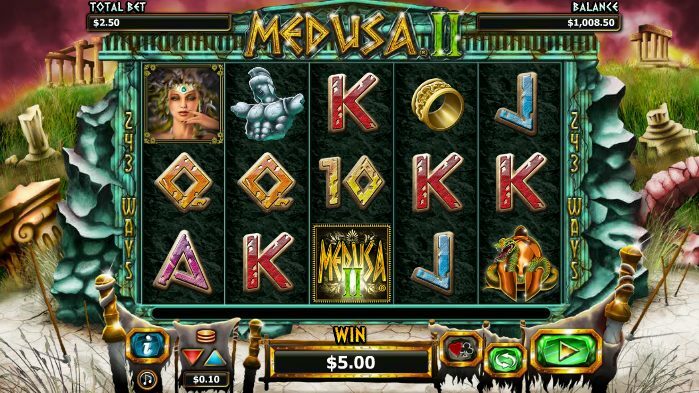 Medusa II is the follow up slot release to the hit Medusa slot that was developed by NextGen Gaming. It is unsurprisingly based on the Greek mythological creature with snakes for hair that had the ability to turn humans to stone with her stare. The original Medusa slot received very positive reviews and has gone on to be one of NextGen Gaming’s most iconic slots. It drew a big fan base thanks to its bonus features that enabled players to win free spins, extra super spins and multipliers. Now, its successor has hit the market and fans of the original will be keen to judge for themselves. 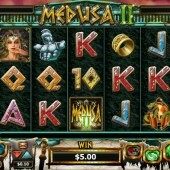 Medusa II is a 5 reel, 243 ways to win slot. The graphics immediately feel like a step up the evolution ladder and the reels possess a certain sinister feel to them with the eerie sound effects only enhancing that vibe. The symbols on the reels include a Greek soldier statue, a golden bracelet, a bow and arrow, a golden snake emblem, a helmet with a snake draped over it and the regular 10 through to Ace symbols to fill up the reels. The Medusa symbol acts as the Stacked Wild and substitutes for all other symbols, except for the Scatters, to complete winning combinations. In a twist on the tale, you will actually want to see Medusa’s glare because rather than turn you to stone it will turn you rich with big pay outs. Also, when the Stacked Wilds fill a reel there is a nice little graphic that pops up of Medusa turning a Greek soldier into stone. The Scatters come in the form of the Medusa II Logo. If you hit three or more of these symbols across the reels then you will trigger the free spins bonus round where you will earn 10 free spins. On each spin, a random set of reels will be locked by the Stacked Wild adding a bit of bite to the free spins. It is also possible to earn at least 5 additional free spins when you hit three or more Scatters across the reels during the free spins. Locked Reels on Every Spin! This slot comes with a Locked Reels feature in the base game too that fans of NetEnt’s Twin Spin slot might be familiar with. On every spin, there is the chance that reels 2, 3, 4 or 5 could become locked with stacked identical symbols. This increases the chance of you hitting five of a kind wins and those wins can pay out some very handsome rewards. Medusa II might as well be called Medusa 1.5. It holds many similarities to the original and, if I am being honest, it really only improves greatly in the graphics department. The Locked Reels feature, particularly during the free spins, is a nice little addition but then it has replaced the Turned to Stone Re-Spins which is a feature I loved on the original. Maybe I’ve developed a personal vendetta against this slot due to the number of times I hit two Scatters and missed out on a third to trigger the free spins bonus round but I do feel like NextGen Gaming have simply released this slot to make a bit of money and have not actively looked to release a better Medusa slot.